Ragazzi fascisti! What a splendid Italian-themed MNFC we had yesterday! The evening started with the assembly of fascist pizzas, on home-made pizza dough (which, in keeping with the pervading fascism of the evening, had earlier tried to take over the fridge). My choice of topping became the Mussolini, whilst Adam showed vegetarian solidarity in claiming the Hitler. Helen felt a bit nostalgic and went for the Mugabe, and other choices covered the Pol Pot, the Genghis Khan and the Ivan the Terrible. The second part of the evening, the film, was also Italian. Jon chose what most film geeks around the world consider to be one of the top ten films ever made, The Bicycle Thieves (Ladri di Biciclette). The film won an Honorary Academy Award in 1950 for general brilliance, and featured in the top ten on the BFI’s list of 50 films you should see by the age of 14. This 1948 film directed by Vittorio de Sica follows Antonio Ricci, a man who has struggled to find a job in the ruins of post- World War II Italy, whose opportunity to earn a living is snatched away by the thieves who steal his bicycle. He sets out to track them down and retrieve his bike, accompanied by his son Bruno. The film portrays the struggles of this working man with bleak realism, though touched at times with humour, in a style known as Italian neorealism. Neorealism was developed in Italy in the 1940s, and was characterised mainly by its focus on the working class, location shooting, and the use of non-professional actors. Neither Lamberto Maggiorani nor Enzo Staiola who play father and son respectively were actors before starring in this film. De Sica claimed that he selected both actors on the basis of their walks. Maggiorani was a factory worker, who ironically lost his job after the film came out, and was forced to become an actor full-time (insert joke about acting and real work here). Staiola, who for me is now the cutest child in the history of cinema, featured in 14 further films, mostly still as a child actor, before finally turning his back on cinema to become a maths teacher (repeat joke about acting and real work here). De Sica was himself an actor, and starred in 157 films between 1917 and 1974. As a director he managed a mere 36, including 2 other neorealist titles – Shoeshine and Umberto D., one of the first and the last of the Italian neorealist films respectively. 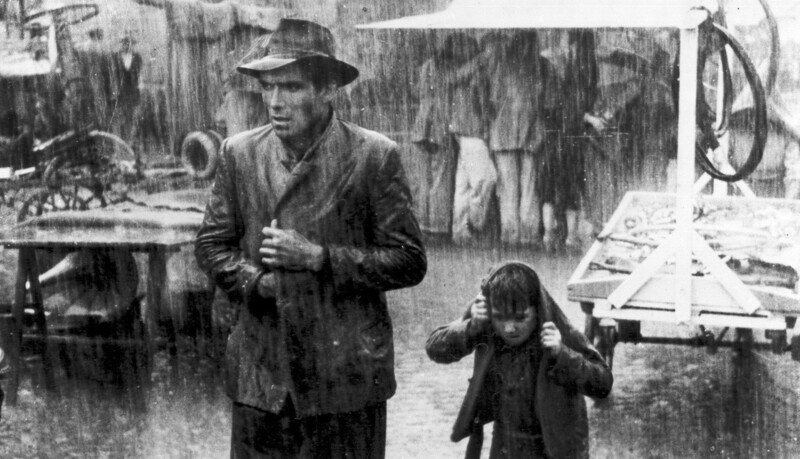 His commitment to realism was taken a bit too far in the filming of The Bicycle Thieves when young Enzo was nearly run over twice while crossing the street during filming. As the scene was shot on location, the two cars happened to pass by at the time of filming and the scene made it into the final film. Post-film discussion involved a fair amount of chin-stroking about the nature of Italian neorealism and its influence on cinema since the 1940s, and discussion of Italian stereotypes. We felt that the subtitles could’ve been a bit more comprehensive rather than leaving us to listen to general overexcited Italian outpourings, but Helen valiantly translated bits and pieces for the benefit of the rest of us. To aid the chin-stroking, Jon produced a BFI-style handout. This came perilously close to betraying the founding principle of MNFC – ‘like book club but without the homework’ – but seeing as all the homework was done by one person I’m prepared to let it slide. This time. Until next time, miei cari. QUESTA NON È UNA DEMOCRAZIA!! Thanks to all those who were able to come on monday, and sorry to those of you who couldnt. Another great Tuesday review from Becca ‘Mussolini’ Picton! If anyone’s still interested and feeling geeky (and the beauty is now we can geek away and noone need every know! ), there’s a couple more links re Bicycle Thieves that may be of interest. The first is a guardian review by Peter Bradshaw. The second, ‘the film that changed my life’ from Chiwetel Ejiofor. We’ll lower the brow asap. The film that keeps on giving… a new article on Neorealism from the BFI is here!